It's a super simple concept, but does take a while to roast these crunchy morsels so plan accordingly. But it's a healthy, high protein snack that cost less than one dollar. I have since made variations using different seasonings, like chili powder and cumin; so play around with these- you can't really go wrong. And think about other ways to eat these besides a snack, like topping salads and hummus or mixing with granola, nuts and m&m's for a healthy gorp mix. Open the can of beans, rinse and drain. 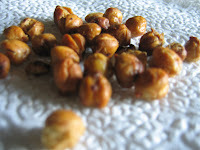 Spread the chickpeas and spray with Pam (or toss with olive oil). Sprinkle with salt and pepper. Bake in the oven until crispy; I used 250 degrees and it took a couple of hours. OMG - this was SOOO easy to make and it is DELICIOUS! We are addicted!! We think you are on to something here Monique... something BIG! I'm so glad you like them and that you're passing on the recipe! This might be the most tried recipe so far- many people emailing me about these tasty morsels! For the record in case anyone is curious - I recently tried 'other' beans, and it doesn't work. The garbanzo is dense; whereas the black, white and red cannot hold up to the heat! 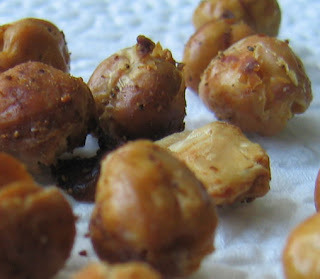 Never tried a crispy garbanzo before. Will try this out. Thanks a lot!